Showing 23 articles from May 23, 2013. Historic Fox Theatre Restorations and Builder’s Surplus Northwest present The Rocky Horror Picture Show, Friday, May 31 at Midnight at the Fox Theatre in downtown Centralia. Come do the “Time Warp Again” with us as we screen this cult favorite for the first time at the Fox. We encourage everyone to dress up and participate during the film. There will be a costume contest with prizes awarded from fantastic local businesses. Don’t forget to bring your newspapers and unbuttered toast! The Oregon Iris or Iris tenax is a native species of Iris that calls Southwest Washington and Northwest Oregon, west of the Cascades home. This appears to be a banner year for the blooms as they are showing up in locations and numbers not observed in recent years. The Oregon Iris was used by Native Americans due to its tough, strong fibrous leaves which were used were used as braids and ties. The plant itself, however was not eaten. Roots and rootstocks, fresh or dry, of all Iris species are poisonous if ingested. In addition, the flowers themselves may cause skin irritation or an allergic reaction. Graduation season is upon us and local high schools are preparing to see off this year’s seniors. Below are schedules of graduation proceedings for Toledo High School and Winlock High School, and Town Crier wishes all area graduates the best of luck with their future endeavors in Lewis County and beyond. Toledo residents may notice a new fixture on the east end of town after Saturday’s Cleanup Day. Local boy scout Ely Tilley has endeavored to build and install a new welcome sign greeting travelers entering by way of the Toledo Bridge, and plans to complete his project this weekend. 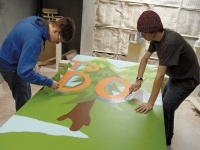 A member of Boy Scout Troop 9352 and senior at Toledo High School, Tilley had chosen to build the sign for his Eagle Scout project and said the idea was not far from his regular creative endeavors. The Country Cruisers Car Club will he hosting their seventh annual car show this Saturday at McMurphy Park in Vader. Open to all residents, those who wish to enter may submit any vehicle, finished or unfinished, for a $15 per car registration fee. Registration begins at 8 a.m. with the show lasting from 9 a.m. to 2 p.m. featuring entertainment from DJ Ron McGinnis. Mrs. Crumaline Ladue, whose husband sailed around The Horn in 1849, told an interesting story. Her husband, after sailing around The Horn, stopped at Astoria where he sold his vessel. He went to Portland for a while and then down the Columbia as far as Mt. Coffin, staking his claim on the west side. During his absence one day, while going across the Columbia to Rainier to do some shopping, five Indians came into the large woodshed attached to the house. Mrs. Ladue and five small grandchildren became very much frightened when they could see through a crack in the door, the Indians sharpening their knives on the Ladue grindstone. The Vision:Toledo Arts, Recreation and Entertainment committee meets 6:30 p.m. Tuesday at the MAC. Visit www.morganartscentre.com or call (360) 864-4ART for details. Vision:Toledo Business Association meets Wednesday at 5:30 p.m. hosted by Caldwells at the original pharmacy/anticipated library building at 241 Cowlitz Street. Catch up on the Rural Communities Initiative Design (RCDI) report, Fire and Ice Scenic Loop, Valley View Health Clinic, and Timberland Library in Toledo update, plus Riverfest and more. Visit www.visiontoledo.org. The Area Agency on Aging will be making a presentation Friday at the Olequa Senior Center. They will be there for the lunch hour, starting at noon. Later that same day, the center will be hosting their monthly Potato Bar from 4:30 to 7 p.m. The cost of a generous baked potato with a wide array of toppings to choose from is $7. Also, I’d like to give another shout-out to the senior center’s craft group. I’ve actually been attending their weekly get-togethers on Thursdays from 10 a.m. to noon, and they’re an amazing group. I would highly recommend that any crafter (particularly with yarn craft expertise) join in, and beginners are very welcome. For more information, please contact the center at (360) 785-4325. Property owners in Pacific County will soon receive their new assessed valuations for 2014 property taxes. Property owners have 30 days from the mailing date to appeal their new values to the County Board of Equalization if they disagree with their new value. The appeal deadline date will be on your notice and will be around July 1. When it comes to berries, there’s no question that strawberries continue to rate first place among the majority of home gardeners. Lena Ostbye, 97, a Centralia resident, died Friday, May 24, 2013 at the Providence Centralia Hospital. She was born June 10, 1915 in Startup, Wash. to Henry and Pauline (Mittelsbach) Pehl. Recent articles in the Town Crier have given us a pretty clear picture of the running debate over the valve questions that derailed the $76,500 grant for paving lower First Street. To readers, it’s a sad commentary on what appears to be the dysfunctional nature of the Winlock Town Council. They have disputed over whether to complete this important repair project for two years, and even with looming time restraints on the grant couldn’t get their act together. It leaves one to wonder if personal differences have been allowed to supersede the needs of the public. The Toledo City Council has approved an agreement to use the aerial mapping services of New York-based Pictometry International to help modernize the way utilities are mapped throughout in the city. During the May 20 City Council meeting, Public Works Superintendent Craig McCown said using Pictometry’s software and services would be a significant upgrade from their current use of Google Earth, stating he hopes to update the way his department does business. An anticipated discussion regarding law enforcement alternatives was tabled during the May 21 Vader City Council Meeting as the Lewis County Sheriff’s Office had yet to submit an estimate for the cost of increased service. Mayor Ken Smith said, though he had expected a reply from Sheriff Steve Mansfield prior to the meeting, the estimate was still being prepared and Smith encouraged the council to wait until their next meeting, or a special meeting beforehand, prior to discussing their options further. Two weeks ago, it was Brittany Moore that was featured in Town Crier Sports and, true to form, Brittany and cousin Austin Moore, seniors at Castle Rock High School came through in the classic 400 meter race as champions at the 1A District IV Track meet at Rainier last week. Both are now heading to the next level. Austin is returning to the big stage on the campus of Eastern Washington University where he has been a competitor for the last three years. Last year as a junior, he placed 2nd in the 400 meters at the 1A WIAA State Track Meet. Currently, he has the 2nd fastest time behind another Moore (Alexander Moore of Charles Wright Academy in Tacoma), with his season best 50.51. Crime Stoppers of Lewis County, the Riverside Fire Authority, and the Centralia Police Department are seeking your assistance in five fires, intentionally set during the early morning hours of May 3 in the greater Chehalis and Centralia area. The first fire was reported at 1 a.m. at the Firehouse Espresso Stand located at 2391 Kresky Ave., Chehalis. Firefighters found the rear of the structure on fire and the cause of the fire is currently undetermined with an approximate loss of $5,000. A New York resident was cited for attempting walk away with a stolen had from Gee Cee’s truck stop near Toledo May 22, according to the Lewis County Sheriff’s Office. Mikhail Kochkarez, 60, of Brooklyn, was contacted after employees at the truck stop called to report he had taken a $16 hat and attempted to hide it in his coat. When Kochkarez was contacted, he is alleged to have thrown the had in a nearby trashcan. Local EMS officials are nearing a compromise to continue operating Lewis County Medic-One after Fire Districts 15 and 20 had submitted their intent to withdraw from the program earlier this year. Formed by an interlocal agreement between Fire Districts 15 (Winlock), 2 (Toledo) and 20 (Vader/Ryderwood), Medic-One has seen a steady increase in expenses and a decrease in revenues in recent years and interlocal leaders have disagreed sharply on how to sustain the program. 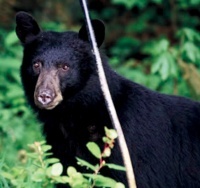 A large black bear has been sighted within the city of Vader and residents are being warned to exercise extreme caution. First seen in the vicinity of A. St. May 16, a male bear estimated to be at least several hundred pounds in size has been popping up around town with at lest four sightings reported to officials so far. Residents are being urged to not approach the bear or attempt to neutralize it, as discharging a firearm within city limits is still illegal, but instead to contact authorities upon witnessing the creature. Taylor K. Rebman, 21, a transient formerly of Kelso, is wanted on a $25,000 warrant on suspicion of trafficking in stolen property, possession of stolen property and resisting arrest. High school graduation should be a happy time and a time to celebrate the accomplishments of students.